When I got the June Hero Arts kit, I decided that I also needed the Add On product called the Reef Die. and the add on stencil from the April kit, although I don’t really know why…………..clever marketing by Hero Arts, probably. 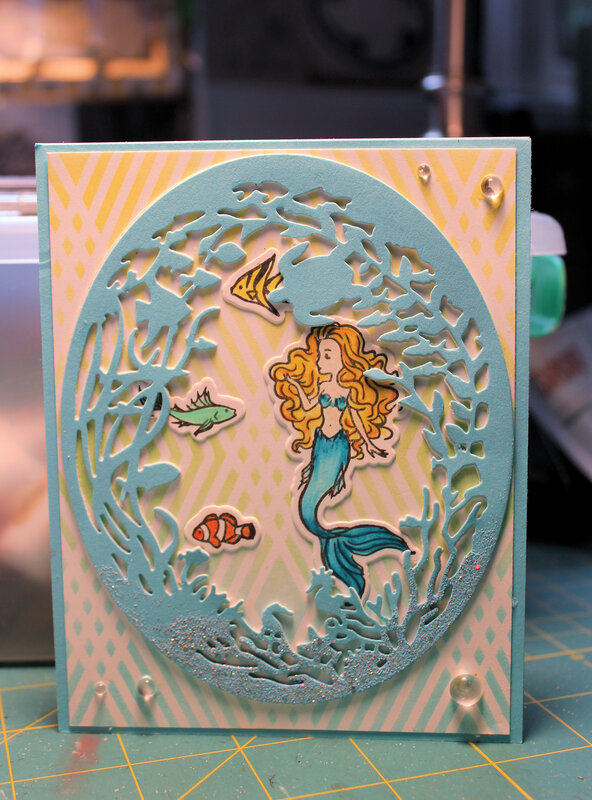 Anyway recently, I made a card using the kit itself along with the Reef die and the stencil. Even though the May kit came with an Ocean wave stencil that is amazing and perfect, I decided to use the graphic add on stencil that I got, which was designed to go with the Fashion Model April Kit. To add to the mystery, I also used yellow and green as the colours for the ocean. Somewhat surprisingly, I like the finished result. I used Nuvo blender brushes to put the colour through the stencil and was very happy with the light colour/ no hard edges that I find difficult to achieve with my usual sponge blending tool. I am thinking it will be a birthday card, but I will only add a sentiment, which will be embossed on a vellum banner, when I have decided for sure. Supplies: Hero Arts May kit, Reef die, and Diamond stencil. Papertrey Ink and Pretty Pink Posh clear drops, Wink of Stella, Hero Arts Dye Inks, Copic markers, Recollections embossing powder, Simon Says Stamp card base and Scor tape.